A Northern California fisherman who shot a sea lion last year was sentenced on Friday to 30 days in jail and ordered to pay $51,000 restitution. The fisherman, Larry Allen Legans, was convicted of intentially maiming or wounding an animal. The sea lion, named Sgt. 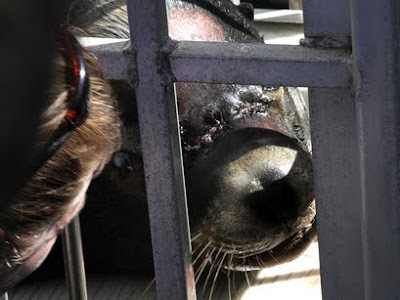 Nevis by his caretakers, was found in November 2009 with a life-threatening wound to his muzzle. It was so bad, the animal couldn't put his head underwater. Legans must pay the restitution to the Marine Mammal Center in Sausalito. Marine veterinarians and volunteers helped take care of Sgt. Nevis. Sgt. Nevis, named after his rescuer, underwent reconstructive surgery last week to repair the gaping hole on his muzzle. He will be a permanent resident at Seal Cove at Six Flags Discovery Kingdom in Vallejo.